Street children struggle to be heard. Their needs are often ignored. They are vilified, marginalised and face many injustices. Help us speak out to right these wrongs and give street children a fighting chance. In the future Laughter Africa plans to support many campaigns. These campaigns may be particularly relevant to the country where we are working or may be related to an issue that affects street children. For instance, it could be a campaign about gender based violence, child combatants or police brutality. This list could go on and on as so many different issues affect street children. We may promote other campaigns about street children in other continents including Asia and Latin America. When we see injustice we won’t be silenced. No matter the issue. No matter the consequence. We will speak out. Together we can help change street children’s lives for good. Every year on 12th April, we celebrate the International day of the Street Child with our friends from the Consortium for Street Children (CSC) and other street children organisations. The day provides a platform for the millions of street children around the world – and their champions – to speak out so that their rights cannot be ignored. The CSC we also will be launching their Legal Atlas on 12th April 2019, an interactive map that highlights laws and policies that affect street children around the world. It will also give information on whether each country’s laws meets the UN’s standards for street children, set out in the General Comment 21.
write a letter to your government and decision makers demanding equality for street children (templates are available on the CSC website). Promote the day and share our message via social media. Raise awareness of the day by displaying posters in offices, schools, churches and community centres so that more people know about the day (posters are available to download from the website). Our friends at the Consortium for Street Children have made some fantastic resources so please visit their website to download all you need to start celebrating the International Day of the Street Child. 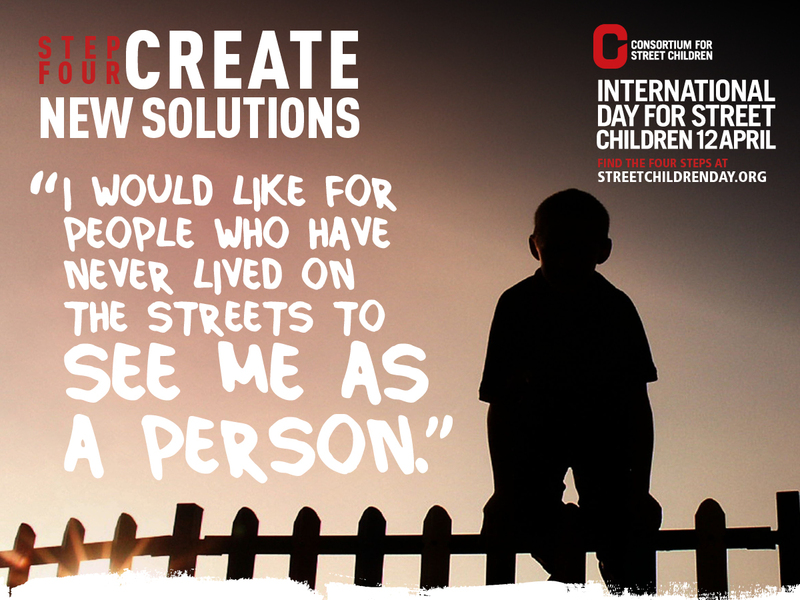 2018 saw the launch of the new CSC’s global campaign to implement the UN General Comment No21 on Children in Street Situations. 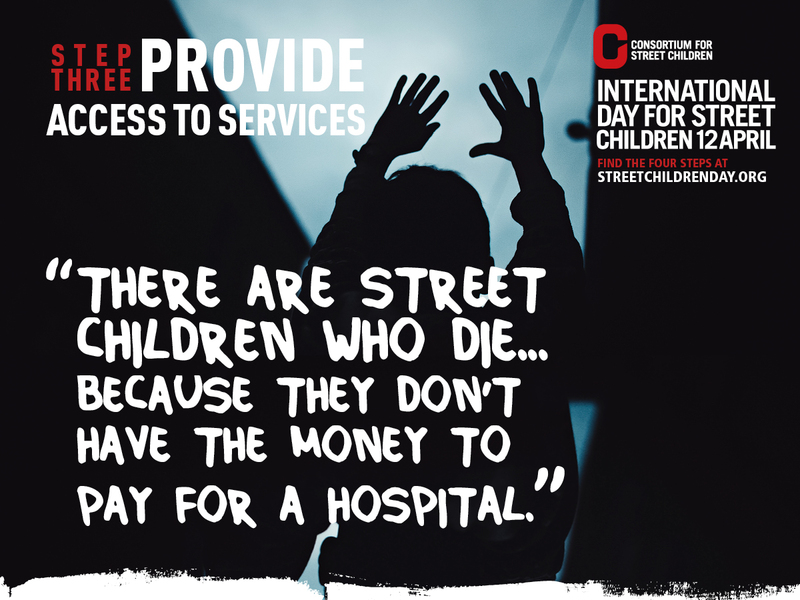 The General Comment was published by the UN in late 2017 and, for the first time, acknowledges that governments must pay special attention to ensure street children are able to access their rights, and sets out comprehensive guidance in order to do so. You can read the General Comment here. We believe in the power and potential of the General Comment. It is an excellent guide for governments all over the world because it is based on the Child Rights Convention and takes into consideration the demands and needs of street-connected children. It puts forward recommendations that speaks to their unique circumstances. We know that if governments were to implement it in its entirety, the world WOULD change for street-connected children. Equality would be achieved – street connected children would have protection in law, access to services and personal dignity. Children everywhere would be equally treated. You can take part in this campaign anytime throughout the year. This campaign will be ongoing and we know that it’s not going to happen overnight. It will take years for Governments around the world to adopt the General Comment. The CSC published an Advocacy and Action Guide which has lots of ideas and provides practical tools that you can use in your strategies to promote implementation of the General Comment at local and national levels.We have a long journey ahead of us but it will be worth it. The time to get going is now. 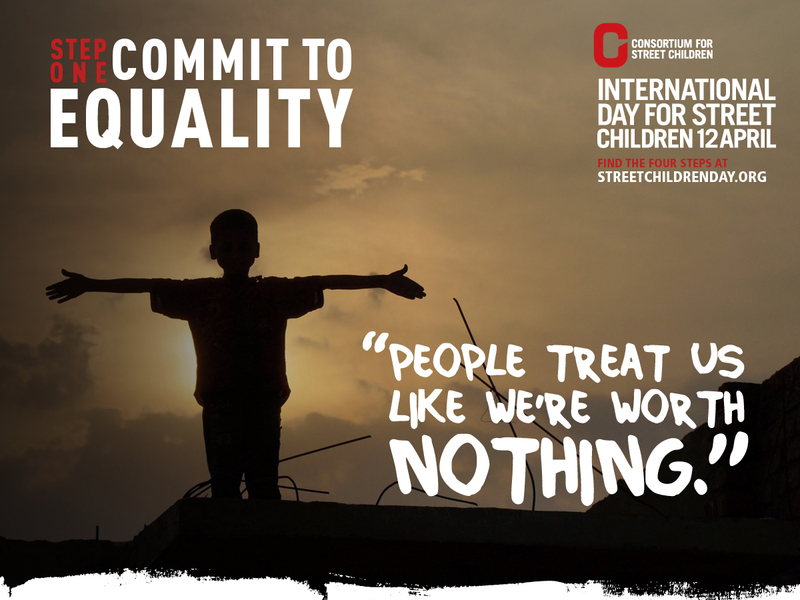 Equality for street children starts here.Let’s make it happen. MPs have a vital role in standing up for the rights of street children around the world. Politicians in the UK can have a massive influence – not just at home, but also on the international stage like the UN, EU, and G8 – and it’s their job to represent you. We need to remind our MPs how much their constituents care about street children’s rights and ensure that street children’s rights around the world are protected. Click here to find your MP. You could visit them in person during their surgeries, write them a letter or email or even arrange a media stunt which your MP could attend. 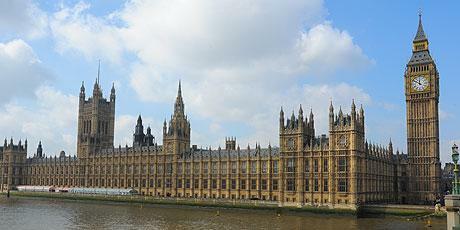 You can also find out more information about your MP here including their activities and voting records in Parliament. Share our online petitions via social media with your friends and family and encourage them to sign too. However you chose to take action – THANK YOU!